Painting Oil on Canvas | 20" x 24"
Painting Oil on Canvas | 48" x 72"
Painting Oil on Canvas | 15" x 48"
Painting Oil on Canvas | 28" x 28"
Painting Oil on Canvas | 22" x 30"
Painting Acrylic and Oil on Canvas | 12" x 12"
Painting Acrylic and Oil on Canvas | 40" x 30"
I believe that the texture of life is like the surface of a block of clay which is shaped and moulded by the circumstances of daily conflicts, personal as well as collective catastrophes and individual questioning. For me, my work lives on this quest until it becomes a rite of realizations, a struggle for the possibility to order the sensation of consciousness. My art is a dimension of my internal emotion and I express them through an endless array of colours. My fondness for nature is transferred into the vibrancy and lifelikeness of my art. Bahadur Singh has graduated with a B.F.A. (Painting) from the College of Arts (Delhi University) in 2001. 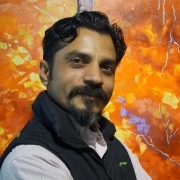 His work can be found in the PM’s house, 7th Race Course Road, New Delhi. It can also be seen in the education department, New Delhi along with AIFACS gallery, New Delhi gallery, Art Positive, and Shanta Art gallery, New Delhi. His work can also be found in Denmark, Thailand, Sri Lanka, UK, U.S.A. and in other private collections. Bahadur Singh's artwork is characterised by its vivid, almost psychedelic colours, which shows off each aspect of his painting. Dark and light shades mingle and contrast each other, creating both dark shadows and glowing lights. This medium also allows for a subtle texture, which adds to the realism of the piece. In P.M House 7th Race Course Road, New Delhi. In Education Department New Delhi. Gallery Art Positive New Delhi. Shanta Art Gallery New Delhi.